The legendary bass player and producer, Victor Rice has been involved in so many significant and classic ska albums. It is a testament to how important he is to the scene his vast resume. However, despite being so prolific in his abilities to work with ska bands of all styles, and as a musician for other's projects, Rice, who is a songwriter himself, is working to establish himself as such. With his second solo album, In America, Rice follows up with his debut ska/reggae/dub album, 1999's Victor Rice at Version City, which received high praise from critics and fans alike, with a record chalk full of melodies, grooves, and rhythms-o-plenty. 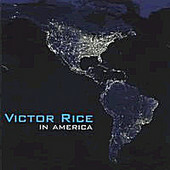 In America is the whole package, a phenomenal testament to the talent that is Victor Rice. For ska purists, not adding this to your collection would be a sin. "Drum Thief", "Fernandinho" and "Parabens" are just a few of the notable great songs. In addition, Victor Rice gathers many great NYC musicians to help him on this album. Notably, Victor Ruggiero (Slackers), Eddie Ocampo, and Victor Axelrod collaborate with Victor to build a well-rounded ska/reggae album. One of the best albums of the year - not just in the ska genre.